18. FINRA monitors Brokers to ensure federal regulations are being followed. It also seeks to protect Investors from unscrupulous sales tactics. 19. Compliance monitors the ETF issuer and funds for compliance with regulations, policies, and procedures. 20. The Trustees monitor vendors and the general management of the trust to ensure shareholders’ rights and interests are being protected. 21. The Legal team assists the ETF Issuer with contracts and provides general counsel. It also sets the agenda for regular and special meetings of Trustees. 22. The Index Provider transmits daily index constituents to the ETF for the purpose of tracking the portfolio. 23. 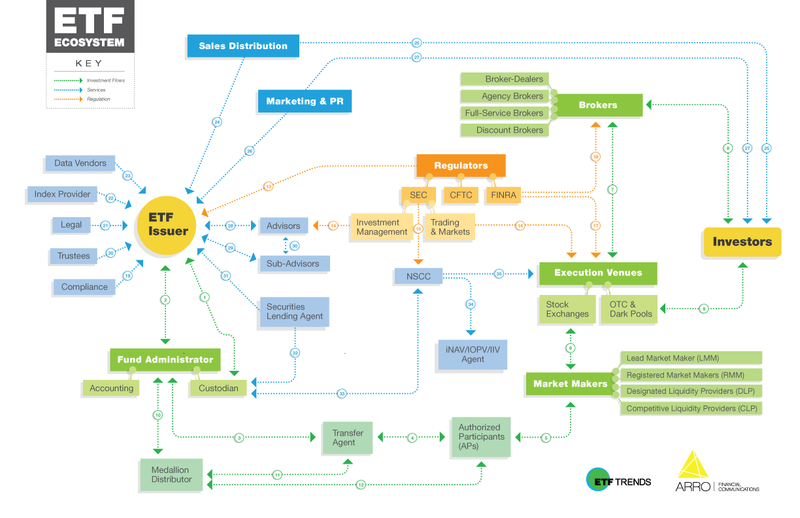 Data Vendors communicate various data points such as securities pricing, corporate action information, and website informatics to the ETF Issuer and its service providers. 24. The Sales Distribution team of an ETF issuer is usually in-house, but can be outsourced to a 3rd party. 25. The Sales Distribution team works to sell the ETF to Investors. 26. Marketing and PR sets messaging strategy as well as methods of communicating the ETF Issuer’s products to investors. 27. Marketing and PR communicates key information about the ETF to Investors by shaping branding, educational content, and messaging, as well as arranging media opportunities and appearances. 28. The investment Advisor monitors and manages the day-to-day operations of the ETF and its other service providers. 29. A Sub-advisor, if engaged, manages all or part of the investment portfolio of the ETF. 30. A Sub-advisor may be engaged on behalf of the primary investment advisor to manage some, or all, of the portfolio’s assets. 31. The Securities Lending Agent acts as agent of the Fund to manage the lending of portfolio securities. This service generally does not start until the fund has some scale. 32. The Custodian and Securities Lending Agent work in tendem to facilitate the borrowing of securities with proper record-keeping. 33. The Custodian transmits creation/redemption baskets nightly to the NSCC (National Securities Clearing Corporation) who then disseminates it to all member firms including back to the custodian. 34. The NSCC (National Securities Clearing Corporation) transmits ETF constituents to the IOPV (Indicative Optimized Portfolio Value) calculation agent each morning to generate estimated intra-day share price. 35. The NSCC (National Securities Clearing Corporation) transmits official creation/redemption basket to Exchanges for public dissemination. Accounting Firm that calculates daily NAV. Advisors Entity that manages the investments of the ETF as defined in the prospectus. Agency Brokers Brokers only acting as agent on behalf of customers and not as principal trader for their own account. Authorized Participants Entities that transact in the primary market by creating and redeeming new ETF shares, which can then be sold in the secondary market. Broker-Dealers A firm that buys and sells securities for its own account as well as selling to customers. Brokers General term describing individual or firm that buys and sells securities on behalf of investors. CFTC Commodity Futures Trading Commission – US government agency that regulates the futures and options markets. Compliance Internal and external groups that monitor, detect, and prevent misconduct of rules designed by regulators. Custodian Firm that holds records of asset ownership as well as facilitating instructions for corporate actions. Data Vendors Firms that provide various data to vendors including pricing data, market data, data to populate the fund website, and more. Discount Brokers Brokers typically only offering bare-bones execution services without research and personalized advice. FAs Financial Advisers (FAs) typically operate through a broker dealer, are regulated by FINRA, and fall under the suitability rules. FINRA Financial Industry Regulatory Authority – A self-regulating organization that oversees organizations that facilitate the buying and selling of securities. Full-Service Brokers Brokers providing research and advice to clients in addition to executing trades. Fund Administrator Firm that provides legal, business, and financial support services to assist the ETF in operating as an ongoing entity. iNAV/IOPV/IIV Agent Indicative Optimized Portfolio Value. Real-time calculation that estimates the per share value of an ETF throughout the trading day. Index Provider Firm that generates the investment portfolio strategy, which will be the basis for the ETF’s investments. Investment Management The Investment Management division of the SEC works to protect investors through asset management industry regulation. Legal Internal and external groups that advise and protect companies as related to business law. LMM/DLP/CLP Different listing exchanges’ names for the entities that agree to provide simultaneous bid and ask quotes to ensure liquidity and an orderly market. These entities have clearly defined quoting obligations and incentives that must be met on an ongoing basis. Marketing & PR Group or firm that provides sales collateral, educational content, and advertising in support of asset-gathering and the sales force. Medallion Distributor Serves as the underwriter for new shares. Also facilitates dealer agreements and 12b-1 fees, if applicable. NSCC National Securities Clearing Corporation – the centralized security depository in the United States. OTC & Dark Pools Execution venues which allow larger buy side firms to transact while preserving some anonymity. Primary Market Also known as the new issues market, this is where buyers can transact directly with the issuers. Registered Market Makers Entity that may provide bid and ask quotes for an ETF but does not have the same obligations or incentives as the Lead Market Maker. Retail General term describing individual investors investing for their own account or through an adviser. and fall under the 40 Act fiduciary standard. Sales Distribution A firm’s sales team, whose job is to raise assets in an ETF by educating and selling to financial intermediaries and investors. SEC Securities and Exchange Commission – US government agency that oversees the financial markets to protect shareholders and create capital market integrity. Secondary Market This is where investors trade previously issued securities among themselves, without involving the issuers. Securities Lending Agent Financial entity that is willing to pay to borrow the underlying securities in the fund. Self-Directed Individuals making their own investment decisions. Stock Exchanges Markets where individual equity securities, including ETFs, can be bought and sold. Sub-advisors Firm hired by advisor to manage all, or a portion of, an ETF’s investment portfolio based on its specific objectives. Transfer Agent Firm that prepares and maintains documents and records related to shareholder accounts. Trustees Group that governs high-level ETF administration and strategy in order to represent and protect shareholders.